We had a chance to talk to Tyler Duguid after his return from Romania where he represented Canada at the U20 Junior World Trophy tournament. Along with Tyler for the interview were his father Scott and mother Tanya. 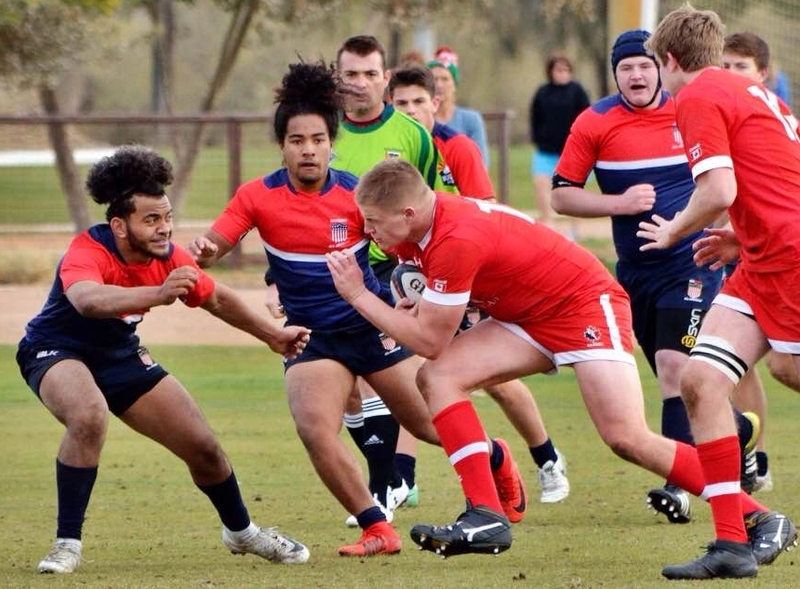 We didn't realize, until after the interview, the extent of the family's rugby connections with not only Tyler a Canada age grade player but his brother Kaden and sister Abby currently playing for Canada at the U19 and U20 level respectively. Also uncles John and Luke Tait are well known in the rugby community having played professionally in Europe and representing Canada. John is currently the national women's 7s coach. Tyler: I started around U13, so about 12. My first game was with the Nor'Westers rugby club. I played high school rugby for Harry Ainlay Titans for 3 years, I play a different position there, #8 instead of lock. We won Provincials in our last year. Q: Do you play prop as well as second row? Tyler: Ya, for U20 I was too young to be a prop but I'm kinda growing, another inch and I'll be out of the position of prop, it's just harder against guys shorter and stronger. I'm only 17 so was ineligible [at prop] for the JWRT. Q: What's your height and weight now? Tyler: I'm 6' 5" and 250, around there. My brother is 6' 7" so I figure I have another inch to go. Q: Where did you go after high school? Tyler: I'm at U of A [University of Alberta], I'm also wrestling here. I play football as well but I'm taking the season off this year to focus on school and coming back to wrestling. It's just a lot to take in and I want to get good marks my first year. I've been wrestling for a while, I just won the national championship for Greco Roman and won silver in Freestyle. University of Alberta doesn't have a varsity rugby team, I'm just here for football and wrestling. In the off season I work with the Wolf Pack and focus on rugby, I'm starting to come to terms with the fact that rugby is going to be my main sport. Q: What about the Centralized option out in Langford, is that something you've thought about in the future? Tyler: Yes, there's an offer, we're talking with them and just working out the details. I see myself in the future playing with Rugby Canada and that being my future sport. Q: If an MLR offer came in a few years what would your response be to that? Tyler: I'd go for that, for sure. Both of my uncles played overseas so a professional league somewhere. Q: Tell me a little bit about the experience in Romania with the U20 team? Tyler: It's the first time on a European tour, I went to Hong Kong with the U18s. I went to New Zealand, that was with the For the Love of the Game program and Dave Lougheed. The tour to Romania was a really good experience, I was a little under age and a lot of the guys I didn't know because I came up for the one camp and a lot of these guys were together about two months before me, it was a big leap to go with a new team to such a big tournament. I felt like I played well, it was a great group of guys, I had fun there, the rugby there was really good, especially playing against Fiji, they were a tough team. Q: What's the next rugby action coming up for you? Tyler: The next will be with the U20 team down in, I think, San Diego, the last 5 or 6 days of December. Q: Your brother also plays rugby? Tyler: Yes he's one year older than me, his name is Kaden. He played for Canada U19 over in Ireland, my sister Abby also plays for the Canada U20 women. Kaden plays for Nor'Westers and plans to go to James Bay for rugby in a couple of weeks. Q: How has Tyler's growth in rugby affected the family dynamic? Scott (father): It's been great actually, we're a rugby family with Tyler and Kaden being with the Canada U19 program and Abby with the Canada U20 program. I'm Tyler's high school coach and club coach and his mom is a manager with the Alberta Wolf Pack rugby so every one of us in this family is involved in rugby in one way or another. It's great for us to see all of our kids succeed. We come from a rugby family with John [Tait] the current Canada women's 7s coach, he played over in Cardiff and in France and for Canada for several caps, and Luke [Tait], my wife's other brother, who played over in Italy and France and for Canada for several caps, it's a strong rugby family. Q: Anything further to add? Tyler: I'd also like to add a thank you to Pat, Jeff, Adam, Gethin and the other coaches for all the contribution to the coaching.